It’s that time of year again where Breakout try to pay back to the community. The two charity days we hold each year are really important to Breakout and who we are, because we’re aware we wouldn’t be here without the people of the cities we’re based in. We held our first charity day in April 2015 at our flagship Manchester branch and each time we’ve done one since it’s got bigger and bigger, and now involves the sales of all of our rooms becoming charitable donations and a way of getting local charities actively involved in what we do. And by all our rooms we mean at all four cities, so that’s Manchester, Liverpool, Cardiff and Chester all trying to help in the small way we can. In 2016 we raised over £6000 with our charity days and we strive to smash that target this year as well. We dedicate certain rooms to the different charities, and then any sales during the day time from that game become donations for them. In the evenings we tend to give these games to the charities themselves to do with as they will. Some sell them on to members and patrons, others get sponsorship for their service users to play and some even raffle their games off. It is completely free for them to do as they will. Selecting our charities is a careful process, there are some that are just close to our hearts and others that we find from the local area (as much as possible). The Christie, Cheshire Search and Rescue, Early Break, Bolton Hospice, The Guide Dog Association, Joining Jack and Parkinson’s UK. 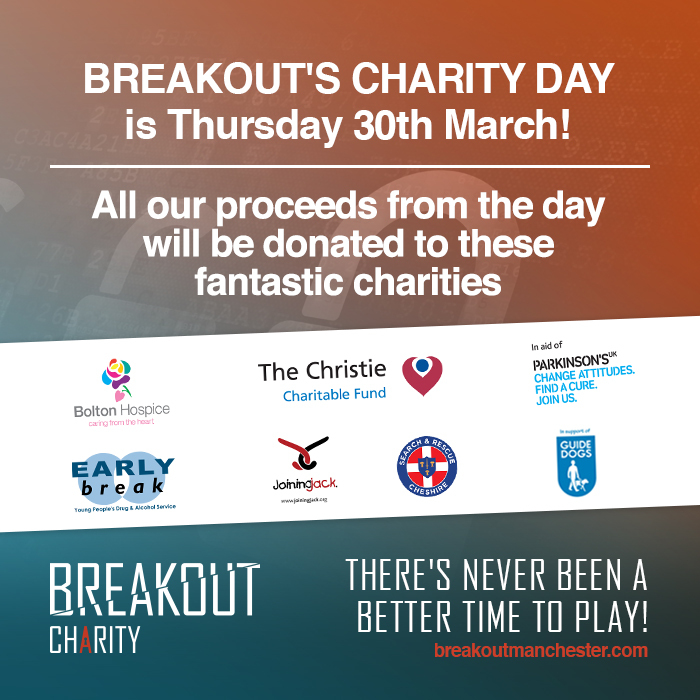 The Christie is very special to Breakout and have been involved with our charity days since the very beginning. They’re a charitable cancer research hospital based in Manchester. Their funding goes towards providing specialist and cutting edge treatments that the NHS can’t provide to people, but alongside this they also research into finding and innovative treatments for various cancers and hopefully an eventual cure. As well as treating people here, The Christie spend a large amount of money every year sending people to America for special PROBEAM treatment, but are also working very hard to be able to offer it themselves here within the next few years. The rooms being dedicated to The Christie are Captured, Most Wanted and Identify (which are all at our High Street site). Cheshire Search and Rescue were one of our most successful charities on our last charity day. Cheshire Search and Rescue are a completely voluntary based charity who work to help find those who are lost in Cheshire. Sometimes we don’t think of Cheshire as a dangerous area, but there is actually an exceptionally large amount of woodland, quarries and moors so there are, in fact, many hazardous areas. As well as countryside based operations, Cheshire Search and find vulnerable people who have either ran away, or left their safe space and don’t have the capacity to find their way home. We can often be scared enough when we find ourselves alone, but throw in a dangerous environment and this becomes unsafe very quickly. The Guide Dogs for the Blind Association are a charity that train guide dogs and pair them with people are are either blind or have visual impairment. This process involves making sure that a person gets paired with a dog with a compatible personality in order for them to both look after each other well. As well as this though, the charity also does a lot more; they also campaign for the rights of people with visual impairment, create eye care education, fund research into eye diseases, provide confidence building rehabilitation to adults, children and young people, to name just a few. Breakout have never had the chance to work with The Guide Dogs for the Blind Association before, but really looking forward to getting to know more about them (and hope they bring dogs). Early Break UK are a charity based on Bury and Rochdale who work with young people with drug addictions. Not only do they work with young people using innovative services, but they work with their families as well in order to focus on protection and support for these vulnerable young people. In order to provide support to young people whose lives are still being affected by substance misuse, Early Break run a residential service for those who need the service to benefit their recovery. In addition to this service they help research into the area of young people and substance misuse and then distribute the findings while providing an educational platform to substance users and those who provide support to make sure support is provided in the most effective way. Bolton Hospice place the highest value on respect and choice and work to improve the lives of people who have been diagnosed with illnesses that they may not recover from. The aim of their work is to encourage as active a life as is possible from diagnosis until the end of the person's life, no matter how long that might be. This includes considering their emotional, spiritual and social needs and doesn't always take place in the hospice building, but also at the home of the people in their care. It is important to Bolton Hospice that people are cared for not only in their remaining time but they also achieve the good death they want by making sure there is time to plan, that they are supported and cared for and their decisions are respected. Joining Jack are a charity dedicated to raising money to support research to try and end Duchenne’s Muscular Dystrophy. This muscle breakdown affects 1 in every 3,500 male children worldwide. And last but not least, Parkinson's UK strive to support people with Parkinson’s in the UK. They put a lot of effort into research to find new treatments to help those with the disease are working towards curing the disease completely one day. Between now and the date we’ll release on twitter which games support which charities, but all of them are fantastic causes so there really is no better time to play than our charity day!